I have been using JQuery for a couple of years now and it has helped me to solve many problems on the client side of web development. You can find all my posts about JQuery in this link. In this post I will be providing you with a hands-on example on the JQuery Roundabout Plugin. This is a plugin that supports circular rotating display for content. It supports autoplay. In this hands-on example I will be using Expression Web 4.0.This application is not a free application. You can use any HTML editor you like. You can use Visual Studio 2013 Express edition. You can download it here. 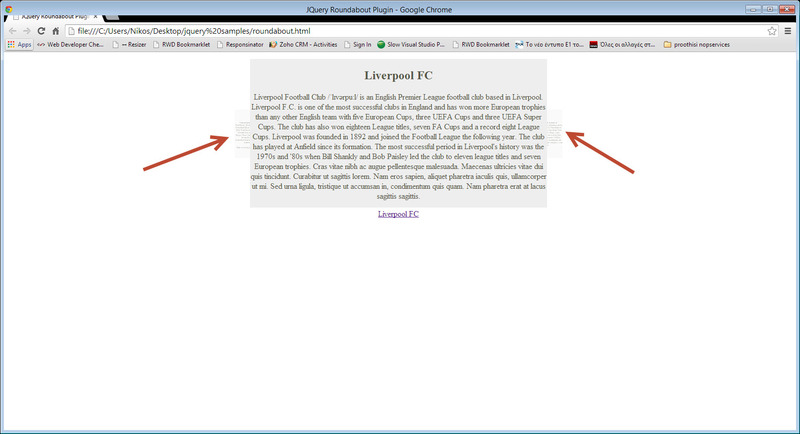 <p>Liverpool Football Club /ˈlɪvərpuːl/ is an English Premier League football club based in Liverpool. Liverpool F.C. is one of the most successful clubs in England and has won more European trophies than any other English team with five European Cups, three UEFA Cups and three UEFA Super Cups. The club has also won eighteen League titles, seven FA Cups and a record eight League Cups. ut sagittis lorem. Nam eros sapien, aliquet pharetra iaculis quis, ullamcorper ut mi. <p>Everton Football Club /ˈɛvərtən/ are an English Premier League football club based in Liverpool. The club have competed in the top division for a record 110 seasons (missing only four seasons, all at level 2) and have won the League Championship nine times. I have included the JQuery file and the JQuery Roundabout plugin file in the head section. I have some content in an unordered list and some internal styles to give them some basic styling.The markup and the styles are pretty basic. Have a look at the picture below to see the plugin in action. You can set options on Roundabout to change how it behaves.We do this by passing in an object of options into the main Roundabout call upon initialization.